We arrived in one of the darkest places, our first time to the United States. The early Michigan night was pitch black and the sky full of stars, no clue where we were. It was dark but we were welcomed with hugs and laughter and soft carpets to walk on barefeet. When I started to write my story about love an death the new president had not been elected yet. Nobody we met was happy with both canditates anyway. A dark place to be left with no choice. When the sun rose I saw deer jumping through the thicket from a pond back into the safety of the almost leafless forest. The mist rose form the damp meadows, it felt like new frontiers. It was, taking the Sharehaus to yet another continent. From Africa to Europe and now to America! Deep darkness, it feels as if I am understanding it for the first time. God is in deep and thick darkness even when it feels like death, an absence of light. In deep as a Scandinavian I know within there can be a comfortable darkness in winter waiting for spring. I never forget how an Indian girl I once met in Berlin had fallen in love with the dark north of Sweden when aupairing. The sun never rose above the horizon that winter, but the stars and northern lights shone bright and reflected in the surface of the snow. We were able to travel a lot this year. The world had come to us at the Refugio to form a very international community, it made us hungry to see the world again. We had been to Jordan the year before to visit our daughter and and were in invited by Malakehs to visit and pray with her mother in Amman. I so love the generosity of God that is not interested in religion. When we prayed her knee, an old fear left and she could walk. Then Sufi friend Esra invited us and we flew to southern Turkey to meet her family and to get some sunshine. It is a time of firsts including my families hometown Gothenburg, Amsterdam and now Michigan. The water in Turkey was lush and warm very salty. You could look down several meters to the ground into it’s greenblue world. At night we listened to a highway that was between our abandoned holiday home and the endless beach. Mediterranean countries seem all the same. People enjoy having coffee, tea, nibbling olives, hanging around, talking, truly resting in Gods arms and not worrying too much. Here and there is an abandoned and half built hotel or a crumbling concrete wall next to a palm tree and a hungry cat bathing in the sun. And lots of old people just enjoying life and being part. Where are we hiding our elderly in Germany? Our holiday home was gift for a week, it had marble floors and broken handles, sticky surfaces, a staircase we only could climb bowing low and the sound of whining cars form the nearby highway. Arriving at our new place in the dark we ha had almost turned around and left again, alienated. But we stayed, in the darkness of this new world. I love travelling and in the same time I feel the death of my own world when being at completely different places. I always loved the roughness of the new, but it feels as if it now takes time to discover the subtle joys of other worlds. They are not new on the surface anymore, globalisation has it. You have to go deeper to feel the eros of desiring and wanting to understand the other. Searching for a cold beer I ventured with a tiny and slightly borken bicycle into the next village where I was greeted by an old man who shook my hand and welcomed me with a smile before he led me into his tiny store switching on the only light bulb there was. Turkey has real men, well dressed, polite but not insecure. And the have withered and unique faces, full of character like men of the old world, Serge Gainsbourg or Picasso. All my life I wanted a way to be this old man in a blazer, seeing the world with his eyes. Just for an hour, or a day. Or being a sparrow high above the rooftops of Berlins. Or being the singing girl selling soup in a busy street in Bangkok. Maybe impossible, like time travel, because being the other all eros would be gone, all wonder. Yo can’t be tree and in the same time hugging it. But you can get close, as we are deeply connected. Sleeping in somebody’s elses bed we felt like nomads or thieves staying for some nights in an abandoned holiday village on our journey to …? We didn’t try to get form Syria to Europe, but I felt like it, uncertain and lost. Not belonging. We longed for belonging somewhere. As much we like to venture into the wild. Here under the Tukish sky I neither felt myself or somebody else. My old identity seemed lost, my new not found yet. Strange feeling. I am an new creation, and I know and I feel how Jesus has overcome death even though I might still be bound to physically die in this world. Yet I am in the middle of this world, in darkness. What I craved was the rest in someone’s arms, bigger than us. Looking at the world and it’s new nationalism, many feel dishearted. The leaves are falling, diversity becomes blandness, and we are retrackting, feeling powerless. I felt my life was going thorugh a similar stage, a season of pruning. It hurts, but to yield more fruit we have to be cut back. I love being the father of the Refugio, the visionaire, the project developer, the friend and spiritual guide, the handyman, the planner, the PR guy, the writer and storyteller. An yes, the husband and the father of my own kids, the son and brother to my family. I almost forgot, and that is the point. I can’t be it all. Pruning. Is needed. Cutting back the unnecessary in autumn to enable new growth in spring. With winter as death in between. It seems to be a natural life circle, so why were all so distraught when Jesus was hanged and dead? It is a rhetorical question. I would have wept! All these signs and wonders, the divine revolution! And then: death! The end of it. What a disappointment, walking don the street to Emmaus. I think of my friend Hein who died too young. He could not be resurrected, nor by defilibrator nor by our prayers for hours, strangly smiling while his body didn’t lose it’s warmth. He left behind a good life with wife and kids, yet I felt afeter a few days he had chosen to stay in this new rest he had entered. It felt I see him still smiling in the cloud of witnesses sourrounding us, the cloud of love beyond, Hein living a resurrected life. Entering this new place of death and love, he must have seen the bigger picture in which his family would be ok without him. They weren’t for me, but in a wider scope he must have seen them being held savely in Gods arms, or he would have returned. It is a picture I get sometimes praying for the abandoned, the lost, refugees drowning in the sea in overcrowed boats. Once I felt connected to an African woman in hwr 30s who had boarded with all hopes set for Europe, but then the boat had capsized. 700 drowed, most trapped in the lower deck. She was among them, sinking to the bottom of the Mediterrean. It was dreadful, but then I felt her forgiveness and peace. She had entered a geater rest, the perfect refuge. It was a strange comfort coming from someone killed by the loveless darkness of the world. There is deepest sadness about the atrocities and evilness of this world, all of them should haven been avoided, but they happen. And there is a triumph, where all scars, pain, tears, terror will be wiped away and not define us anymore, because death has lost it’s sting, was overcome because after all, love wins. In Turkey I felt death, mine, the worlds, the death of my dreams and desires, and in the same time a deeper peace. We were at an ancient place, tanning in the hot sun at the beach with trucks passing by behind when Elke started piling pebbles. Yes pebbles. There was nothing else to do but to pile pebbles. No internet, no fresh fish to buy, no car, no neighbours, just Elke and me, and some goats ringing their bells invisible on a hill nearby. With no distractions one faces own fears. Mine felt huge suddenly. Having to pay unexpected taxes, battling a flu, politics, new job, being able to write or not, kids, mother, sisters. No big threats but they felt heavy on my heart. I had worn myself down worrying, and the only way to prepare for new fruit was letting go and let him prune. I even struggled to sleep. Unheard of Sven. I love visting my mother, we chat a bit, then I get sleepy after 30 minutes and have to lie down quickly, unable to keep my eyes open anymore. She doesn’t mind, I am her son and kids have to sleep in the middle of the day, even when they are 51. She seems content that the little time I spend with her I snore next door on the couch while she is reading a novel and watching tv and writing an email on her ipad with a mug of cold coffee in one hand and a cookie in the other. Maybe her being at work makes me relax. She always was a hard worker. My mother is beautiful and elegant, reclining on a day bed overseeing her empire of books and notes around her, sourrounded by traditional African masks on the walls and some of her older paintings. When she ventures into the world at almost 80 she clearly in command of things, and yet there is this young girl in her, giggling along with me when we have a cappuchino at the Eiscafé watching people, a stunningly alikelooking gay couple with dogs, an eldery ladies ordering huge portions of ice cream or talking about silly people we remember. I feel very rested having slept on her couch. The same cosy tiredness came when whe started piling flat pebbles at the beach, grey and red ones, some with white lines, some smooth and shiny like marbles, others dark and soft, all formed by relentless waves over centuries and lifted upon this beach so we could play with them. Elkes piles of pebbles looked like little Buddhist temples and we started taking them home to our house and in the end we took some home to Berlin. Yes, we took them all home. We just had hand luggage to fly with and at the airport we pretended our bags were really light when they felt like bags of cement. At our Berlin home I now have to move around very very gently because a fragile pile of pebbles might collapse somewhere. When the sun rose we could explore the Michigan landscape. We met Amish farmers on horsecarts going to social, pick-ups ached by sometimes, everybody waving friendly and smiling. Elke and me were laughing. Our 10 years in South Africa had prepared us for this, and our recent visit to Amsterdam. People in Michigan have Dutch and Scandinavian hertiage. Tall people. Somehow ancient. The Amish even speak something called Pensylvania Dutch. New frontier. I still felt lost. Pruning takes place. It hurts because the unnecessary is removed. It is important. To make this life worthwile. Be be alive and believe afresh. Our life is wasted if we become like big corporations, when we have to be like Thai street venors, working with only a few and always fresh ingredients every day to create delightful dishes. Less is more. Having little and being limited is good. An now y dancing partner, the Holy Spirit, has new moves for me. She leads. And she is not afraid of new steps. We live in darkness, and the political development in the world seems to make it even darker. Yet there is a sky full of stars above us. Above all, there is light. The dreary darkness ist just a scare. It has cracks everywhere, so the light gets in. Leonard Cohen knew that. He died while Im am writing this. He reached the stars he could only describe until now. He tried hard, Greece and psycedelic encounters made him fly a bit, his songs made us soar. Looking at the bright stars in the dark I also realised a beautiful thing. I am not alone, and I made made more friends than I thought. Over a year at the Refugio I experienced what I had envisioned but maybe not really believed, that I have found new friends in an intentional community of the most different faiths and cultures, led by the Great Spirit. He teaches me a new deep joy and calls us to live with him in unity and community. For me that is to celebrate life with old and new friends like Lee who invited us to Michigan and made us fill up our hearts. True community is surprisingly unspectacular. It is to drink wine, to dance and to enjoying the simple things like holding a baby, smiling at a friend, sleeping in my wifes arms or piling pebbles, small and big, colourful and grey. And again and again someone has to stack them together, as all community needs a divine hand that unites and turns its attention towards the stars, the light the world can not overcome. Wir kamen an einen der dunkelsten Orte, unser erstes Mal in die Vereinigten Staaten von Amerika. Die frühe Michigan-Nacht war pechschwarz und der Himmel voller Sterne, keine Ahnung wo wir waren. Es war dunkel, aber wir wurden mit Umarmungen, Lachen begrüsst, und weichen Teppichen. Als ich in der Dunkelheit anfing, meine Geschichte über die Liebe zum Tod zu schreiben, war der neue Präsident noch nicht gewählt worden. Niemand, den wir trafen, war mit beiden Kandidaten glücklich. Ein dunkler Ort ohne Wahl. Als die Sonne aufging, sah ich Rehe, die durch das Dickicht von einem Teich zurück in die Sicherheit des fast blattlosen Waldes springen. Der Nebel stieg aus den feuchten Wiesen, er fühlte sich an als wäre cih ein Pionier am Rand der Welt. Und das wars auch, wir hatten das Sharehaus zu einem anderen Kontinent gebracht. Von Afrika nach Europa und jetzt nach Amerika! Tiefe Dunkelheit. Es fühlt sich an, als ob ich sie zum ersten Mal verstehe. Gott ist in tiefer und dichter Finsternis, auch wenn sie sich anfühlt wie der Tod, wie Abwesenheit von Licht. Es kann eine komfortable Dunkelheit sein im Winter, im Warten auf den Frühling. Ich vergesse nie, wie einmal in Berlin ein indisches Mädchen traf, das in den dunklen Norden Schwedens verliebt war. Die Sonne kam nie über den Horizont, aber die Sterne und Nordlichter leuchteten hell und spiegelt sich in der Oberfläche des Schnees. Wir konnten viel reisen dieses Jahr. Die Welt war zu uns ins Refugio gekommen, um eine sehr internationale Gemeinschaft zu bilden.Das machte uns hungrig, die Welt wieder zu sehen. Wir waren im Jahr davor in Jordanien gewesen, um unsere Tochter zu besuchen und wurden von Malakehs eingeladen, ihre Mutter in Amman zu besuchen und mit ihr zu beten. Ich liebe die Großzügigkeit Gottes, der nicht an Religion interessiert ist. Als wir ihr Knie beteten, wurde eine alte Angst sichtbar und musste gehen. Dann lud uns unsere Sufi-Freundin Esra in die südliche Türkei, um ihre Familie zu treffen und etwas Sonnenschein zu bekommen. Es ist eine Zeit der ersten Male, einschließlich der Heimatstadt meinner Familie: Göteborg. Amman, dann Amsterdam und jetzt Michigan. Das Wasser in der Türkei war warm und sehr salzig. Ich konnte viele Meter bis zum Boden in die grünblaue Welt sehen. Nachts hörten wir die Autobahn, die zwischen unserem verlassenen Ferienhaus und dem endlosen Strand lag. Mittelmeerländer scheinen alle gleich. Die Leute genießen Kaffee, Tee, knabbern Oliven, hängen herum, reden, und ruhen in Gottes Armen. Sie machen sich nicht zu viel Sorgen. Hier und da ist ein verlassenes und halbgebautes Hotel oder eine bröckelnde Betonmauer neben einer Palme und einer hungrigen Katze, die in der Sonne badet. Viele alte Leute genießen einfach das Leben und und sind imner dabei. Wo, fragte ich mich, verstecken wir unsere Alten in Deutschland? Unser Haus war ein Geschenk für eine Woche, es hatte Marmorböden und zerbrochene Handläufe Griffe, klebrige Oberflächen, eine Treppe, die so niedrig war, dass wir uns tief bücken mussten. Und das Geräusch von zischenden Autos von der nahegelegenen Autobahn. Als wir im Dunkeln ankamen, waren wir wieder umgedreht, so fremd war es. Aber wir blieben in der Dunkelheit dieser neuen Welt. Ich liebe es zu reisen und gleichzeitig fühle ich den Tod meiner eigenen Welt, wenn ich an ganz anderen Orten bin. Ich liebte immer die Rauheit des Neuen, aber es fühlt sich an, als ob ich jetzt Zeit brauche, die subtile Schönheit und Freude anderer Welten zu entdecken. Die Globalisierung hat die Oberflächen angeglichen. Wir müssen tiefer zu fühlen, um noch das Eros der Anziehung zum Fremden zu spüren. Auf der Suche nach einem kalten Bier redelte ich mit einem kleinen und kaputten Fahrrad in das nächste Dorf, wo ich von einem alten Mann begrüßt wurde, der meine Hand schüttelte und mich mit einem Lächeln empfing, bevor er mich in seinen kleinen Laden führte, um seine einzige Glühbirne einzuschalten. Die Türkei, dachte ich, hat echte Männer, gut gekleidet, höflich, aber nicht unsicher. Und sie haben verwitterte und einzigartige Gesichter, voller Charakter wie Männer die der alten Welt, wie Serge Gainsbourg oder Picasso. Mein ganzes Leben lang habe ich mir gewünscht, mal so ein alter Mann in einem Blazer zu sein und die Welt mit seinen Augen zu sehen. Nur für eine Stunde oder einen Tag. Oder ein Spatz hoch über den Dächern von Berlins. Oder das singende Mädchen, das Suppe in einer belebten Straße in Bangkok verkauft. Vielleicht unmöglich, wie Zeitreise, weil ohne Betrachter alls Eros verschwunden sein würde, alle Wunder. Ich kann nicht der Baum sein und ihn in der gleichen Zeit umarmen. Aber wir können uns nahe kommen, kurz verschmelzen, weil wir tief verbunden sind. Wie fühlten wir uns wie Nomaden oder Diebe in fremden Betten zu schlafen. Als wären wir auf der Durchreise, nach … ? Wir versuchten nicht von Syrien nach Europa zu kommen, aber es war ähnlich unsicher und verloren. Ich fühlte mich nicht zugehörig. Und wir wollen alle irgendwo hingehören. So viel wir uns auch in die Wildniss wagen, wir brauchen ein Zuhause. Hier unter dem türkischen Himmel fühlte ich mich fremd. Meine alte Identität schien verloren, meine neue noch nicht gefunden. Komisches Gefühl. Ich bin eine neue Schöpfung, und ich weiß und ich fühle, wie Jesus den Tod überwunden hat, obwohl ich in dieser Welt noch physisch sterben muss. Und doch bin ich mitten in dieser Welt, in der Finsternis. Wonach ich mich sehne, ist in den Armen dessen zu ruhen, der größer ist als wir. Die Welt und ihre neuer Nationalismus kann einem Angst machen. Diese Dunkelheit, in der Vielfalt wieder eintönig wirdLangweiligkeit. Das Gefühl machtlos zu sein. Ich spürte, wie mein Leben in eine ähnliche Phase ging, eine Zeit der Beschneidung. Es tut weh, aber um mehr Frucht zu bringen, müssen wir zurückgeschnitten werden. Ich liebe es der Vater der Refugio, der Visionär, der Projektentwickler, der Freund und spirituelle Leiter, der Handwerker, der Planer, der PR-Typ, der Schriftsteller und Erzähler zu sein. Ein Ja, der Ehemann und der Vater meiner eigenen Kinder, der Sohn und Bruder zu meiner Familie. Hätte ich fast vergessen, und das ist das Problem. Ich kann nicht alles sein. Beschneidung. Muss sein. Der Weinstock wird im Herbst beschnitten, um neue Frucht im Frühjahr zu ermöglichen. Mit dem Winter als Tod dazwischen. Es scheint ein natürlicher Lebenszyklus zu sein, warum also waren alle so verzweifelt, als Jesus gehängt wurde und tot war? … Klar, eine rhetorische Frage. Ich hätte geweint! All diese Zeichen und Wunder, die göttliche Revolution! Und dann: der Tod! Das Ende davon. Was für eine Enttäuschung, zu Fuß auf der Straße nach Emmaus. Ich denke an meinen Freund Hein, der zu jung gestorben ist. Er konnte nicht wieder auferstehen, weder duch Defilibrator, noch durch unsere Gebete über mehrere Stunde. Seltsam lächelnd lag er da, während sein Körper wunderbarerweise warm blieb. Er hinterließ ein gutes Leben, mit Frau und Kindern, und doch spürte ich nach ein paar Tagen, als ob er sich entschieden hätte, in dieser neuen Ruhe zu bleiben, die er erlangt hatte. Als wäre er in dieser Wolke der Zeugen ansah, die uns umgeben, die Wolke der Liebe jenseits, Hein, der ein auferstandenes Leben lebt. Als er diesen neuen Ort des Todes und der Liebe betrat, muss er das größere Bild gesehen haben, in dem seine Familie ohne ihn auch ok wäre. Sie waren es nicht für mich, aber in mit dem Blick auf ein größeres Ganzes muss er gesehen haben, dass sie in Gottes Armen sicher waren, oder er wäre zurückgekehrt. Manchmal, wenn ich für die Verlassenen und Verzweifelten bete, die Menschen, die im Meer in überfüllten Booten ertrinken bekomme ich Antworten. Einmal fühlte ich mich mit einer 30jährigen afrikanischen Frau verbunden, die mit allen Hoffnungen auf Europa losgezogen war, aber dann war das Boot gekentert. 700 starben, die meisten im unteren Deck gefangen, sie unter ihnen. Es war schrecklich. Aber dann sah ich sie auf den Grund des Mittelmeers sinken und fühlte ihre Vergebung und ihren Frieden. Sie betrat eine neue Geborgenheit, eine perfekte Zuflucht. Ein seltsamer Trost von jemandem, der eben von der lieblosen Dunkelheit der Welt getötet wurde. Da ist tiefste Traurigkeit über die Gräueltaten und die Bosheit dieser Welt, alles Böse sollte gestoppt und vermieden werden, und doch geschehen sie. Und doch ist da ein Triumph, ein Danach, wenn alle Narben, Schmerzen, Tränen, Schrecken weggewischt werden und uns nicht mehr definieren werden, denn der Tod hat seinen Stachel verloren, wurde überwunden. Warum? Weil die Liebe gewinnt. In der Türkei fühlte ich den Tod, meinen, den meiner Welt, den Tod meiner Träume und Wünsche, und in der gleichen Zeit einen tieferen Frieden. Wir waren an einem Ort der Antike, brieten in der heißen Sonne am Strand, mit surrenden Lastwagen hinter uns, während Elke flache Kieselsteine stapelte. Ja Kieselsteine. Es gab nichts anderes zu tun, als Kieselsteine zu stapeln. Kein Internet, kein frischer Fisch zu kaufen, kein Auto, keine Nachbarn, nur Elke und ich, und einige Ziegen, die ihre Glocken unsichtbar auf einem Hügel in der Nähe läuteten. Ohne Ablenkung steht man seinen eigenen Ängsten gegenüber. Meine fühlte sich riesig plötzlich an. Unerwartete Steuern zu zahlen, eine Grippe bekämpfen, Politik, neue Arbeit suchen, Schreibenkönnen oder nicht, Kinder, Mutter, Schwestern. Keine großen Bedrohungen, aber sie fühlten sich schwer auf meinem Herzen. Ich hatte mich bis zur Erschöpfung gesorgt, und der einzige Weg, mich auf neue Früchte vorzubereiten, war, loszulassen und mich von ihm zu beschneiden lassen. Ich war sogar manchmal schlaflos. Unerhört von Sven. Ich liebe es, meine Mutter zu besuchen. Wir plaudern ein wenig, dann werde ich nach 30 Minuten sehr schläfrig und muss mich schnell hinlegen. Ich bin so müde, ich kann meine Augen nicht mehr öffnen! Sie hat nichts dagegen, ich bin ihr Sohn und Kinder müssen in der Mitte des Tages schlafen, auch wenn sie 51 sind. Sie scheint zufrieden, dass ich die wenige Zeit, die ich mit ihr verbringe, nebenan auf der Couch schnarche, während sie einen Roman liest, fernsehieht und E-mails schreibt auf ihrem Ipad mit einem kaltem Kaffee in einer Hand und einem Keks in der anderen. Vielleicht entspannt mich ihre Geschäftigkeit. Sie war immer ein harter Arbeiter. Meine Mutter ist schön und elegant, sie liegt auf ihrem Tagesbett, ihr Reich von Büchern und Notizen umgibt sie, traditionelle afrikanische Masken hängen an den Wänden und einige ihrer älteren Ölbilder. Mit fast 80 Jahren steht sie mitten im Leben und doch gibt es auch dieses junge Mädchen in ihr, das kichernd mit mir, wenn wir einen Cappuccino am Eiscafé trinken, die Leute beobachtet. Das schwuel Paar mit Hunden, die sie alle ähnlich sehen, die alten Damen, die vor riesigen Eisbechern sitzen als würden sie sonst nichts essen. Oder wie reden über all die sonderbaren Leute, die wir in letzter Zeit getroffen haben. Und dann fühle mich sehr ausgeruht auf ihrer Couch geschlafen zu haben. Die gleiche wohlige Müdigkeit kam, als wir inmitten der flachen Kiesel am Strand lagen. Graue und rote, einige mit weißen Linien, einige glatt und glänzend wie Marmor, andere dunkel und weich, alle durch nie schlafende Wellen und über Jahrhunderte geformt und an diesen Strand gehoben, damit wir mit ihnen spielen können. Elkes Kieselsteinhaufen sahen aus wie kleine buddhistische Tempel, und wir begannen, sie nach Hause zu nehmen, und am Ende sogar nach Berlin. Alle Steine? Ja, wir haben sie alle mit nach Hause genommen. Wir hatten nur Handgepäck. Am Flughafen taten wir so, als ob unsere Taschen ganz leicht wären, während sich jeder wie ein Sack Zement anfühlte. Hier in Berliner muss ich mich jetzt sehr vorsichtig bewegen, weil ein fragile Haufen von Kieselsteinen irgendwo zusammenbrechen könnte. Als die Sonne endlich aufging in Michigan, begegneten wir Amish Bauern mit Pferdekutschen, die auf dem Weg zu Familentreffen waren, viel zu große Pick-ups röhrten vorbei, und alle winkten freundlich und lächelten. Wir lachten auch. 10 Jahre im holländisch geprägten Südafrika hatten uns auf unseren ersten Besuch in Amsterdam vorbereitet. Und auf Michigan. Hier haben die Menschen niederländische und skandinawische Ahnen. Große Menschen. Irgendwie alte Seelen. Die Amish sprechen sogar Pensylvania Dutch. Altes Pfälzisch. Ich fühlte mich aber immer noch verloren. Beschneidung im Herzen. Sie schmerzt, weil das Unnötige entfernt wird. Es ist wichtig, um dieses Leben wert zu machen. Um lebendig zu sein und neu glauben zu können. Unser Leben ist sinnlos, wenn wir wie große Konzerne werden, müssen wir doch wie Strassenverkäufer in Thailand sein, die nur mit Wenigem arbeiten, und immer mit frischen Zutaten, um jeden Tag köstlichen Gerichte zuzubereiten. Weniger ist mehr. Wenig und begrenzt zu sein, ist gut. Mein Tanzpartner, der Heilige Geist, hat neue Bewegungen für mich. Sie führt. Und sie, die Heilige, hat keine Angst vor neuen Schritten. Wir leben in der Dunkelheit, und die politische Entwicklung in der Welt scheint es noch dunkler zu machen. Und doch ist ein Himmel voller Sterne über uns. Über allem gibt es Licht. Die triste Finsternis ist nur ein Schrecken hier. Sie hat Risse überall, so dass das Licht reinkommt. Leonard Cohen wusste das. Er starb, während meine Geschichte schreibe. Er wollte zu den Sternen, die er bis jetzt nur beschreiben konnte. Er versuchte in Griechenland mit täglichen Trips ein bisschen fliegen, und seine Lieder machten und schweben. Mit Blick auf die hellen Sterne im Dunkeln wird mir klar: Ich bin nicht allein. Und ich habe mehr Freunde, als ich dachte. 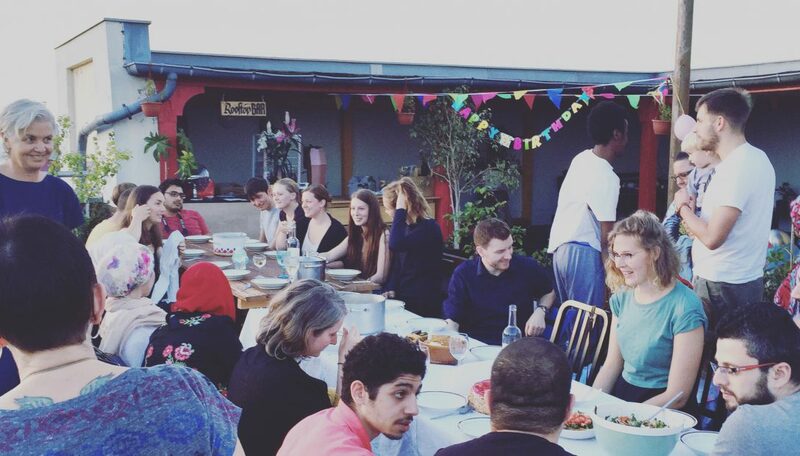 Über ein Jahr im Refugio habe ich erlebt, was ich bis her nur gehofft hatte, dass ich neue Freunde in einer Gemeinschaft der unterschiedlichsten Glaubensrichtungen und Kulturen finden kann, angeleitet vom Großen Geist. Diese Erkenntnis lehrt mich eine neue tiefe Freude. Ich will das Leben feiern, mit alten und neuen Freunden wie Lee, die uns nach Michigan eingeladen und unsere Herzen voll gemacht hat. Wahre Gemeinschaft ist erstaunlich unspektakulär. Gemeinschaft bedeutet Wein gemeinsam zu trinken, zu tanzen und die einfachen Dinge wie das Halten eines Babys zu genießen, sich an einen Freund lehnen, im Arm der Geliebten schlafen oder Kieselsteine stapeln, kleine und große, bunte und graue. Und immer wieder mal muss man sie neu stapeln, denn alle Gemeinschaft braucht eine göttliche Hand, die sie eint und wieder ausrichtet nach den Sternen, dem Licht, das die Welt nicht verfinstern kann.